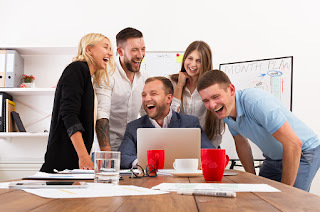 Nothing is more embarrassing than telling a joke and having it fall flat at work, but don't let that stop you from adding appropriate humor to the workplace, as it can be a great way to reduce tension and improve overall relations. When you're the hiring manager or simply someone able to have input into hiring processes, try to look for someone to join the team who approaches work seriously, and themselves lightly. This could come in the form of an easy smile, a little self-deprecating humor, or the ability to find the amusing side in everyday situations that others may consider stressful. When you have someone on your team who can inject some fun into the workplace, it gives others permission to crack a smile as well. A great rule of thumb is that if you would be embarrassed having whatever you want to say plastered on a billboard -- don't say it! Same goes for the grandmother test. If you wouldn't want your grandmother to hear what you've been saying, you probably should abstain. Don't make fun of others even when it's "just for fun," and keep teasing to a minimum. This especially holds true if you're a supervisor or in another position of power. You may not realize that your good-natured poking fun at others can be taken much more seriously when there's an imbalance of power. You're more approachable to others when you're smiling, which may be one of the reasons that many leaders work hard on keeping a pleasant look on their face. When you work hard to uplift others with a pleasant word, even sharing amusing inspirational videos can provide you with some personal collateral to be used at a later time. It's important to note that individuals who appropriately use humor at work are likely to be promoted more quickly and make more money, so there are definite reasons to putting some fun-loving vibes into the air! Using humor appropriately at work can tighten the bond between co-workers, keep those creative juices flowing, and make the days fly by! However, you always have to balance the good times with ensuring you're being as productive as possible on the job. Jokes and effective banter can improve your standing within the organization specifically because it is assumed that you are mature enough to understand the proper use of humor and that you're relaxed and confident enough to call attention to yourself.